La Spezia. 20 June 2018. Analyzing all aspects of the maritime domain to provide a business model that combines industry, science, technology and environmental awareness: this is the goal of Seafuture. 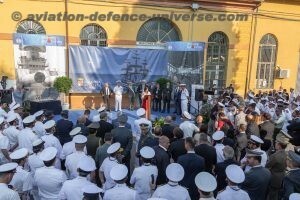 Organized by Italian Blue Growth (IBG) – promoting company together with the Italian Industries Federation for Aerospace, Defence and Security (AIAD), the Region of Liguria and Blue Hub in cooperation with the Italian Navy – the Seafuture 2018 edition will take place from 19 to 23 June in the La Spezia Navy Base,Italy. Seafuture is the only event dedicated to the naval vessel upgrading and life-cycle management based on the use of the most sophisticated technologies available. During the presentation press conference, Cristiana Pagni, president of IBG as well as creator and promotor of the event, provided facts and figures for the Seafuture sixth edition: 9,000 square meters of exhibition space between the historic buildings of the Navy Base, over 40 foreign delegations, 1,500 bilateral meetings between companies and delegations and between companies themselves, 28 conferences, seminars and workshops regarding both technical and strategic policy issues. Around 180 major companies and small-to-medium enterprises, together with other maritime cluster organizations and sector associations including State institutions and Government and non-governmental organizations, mainly from Italy, but also from all over the world will participate in the Seafuture 2018 edition. 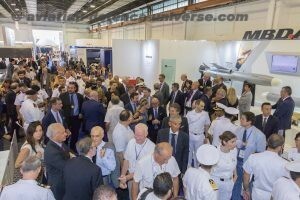 The Italian shipbuilding sector will be represented by Fincantieri, Orizzonte Sistemi Navali, Intermarine, Cantiere Navale Vittoria, Effebi, Ferretti Security and Defence (FSD), Baglietto Navy, Novamarine, Stem Marine, CABI Cattaneo and Zodiac, along with the combat system and naval equipment suppliers including Leonardo, MBDA, Elettronica, Calzoni, GEM Elettronica, Gay Marine, Civitanavi Systems, Ingegneria Dei Sistemi (IDS), Martec, RINA, Seastema, Sitep, Insis, Elsel, Nuova Connavi, Drass, Eurocontrol, Fiocchi Munizioni, MTU, Volvo Pent, Thales Alenia Space Italia, the French shipbuilding giant Naval Group and Thales, NATO’s Centre for Maritime Research and Experimentation (CMRE) and the Ligurian Cluster of Marine Technologies (DLTM). Foreign delegations and operators will have the opportunity to visit and experience at sea demonstrations not only onboard latest generation warships such as the Italian Navy multi-purpose FREMM frigates in both anti-submarine (ASW) and general purpose or anti-surface warfare (ASuW) configurations but also onboard the newest smaller vessels and boats produced by the Italian shipbuilding sector, in addition to the Italian Navy’s older vessels which could find new life through a proper refitting and upgrade project, to be managed by the national shipbuilding industry. Besides ITS Virginio Fasan and ITS Luigi Rizzo – respectively ASW and ASuW-configured multipurpose frigates developed and built under the joint French-Italian programme managed by European OCCAR agency – and the Amerigo Vespucci training vessel, foreign delegations will have the opportunity to experience at sea demonstrations, among others, onboard Ferretti Security and Defense (FSD) 20-meters FSD195 fast patrol vessel in a new variant, Baglietto Navy’s 15-meters FFC-15 fast multipurpose transport landing troop vessel and Stem Marine 7.5-meters STEM 750 Jet rescue boat. It will also be possible to see the 12-meters SWAD (Sea Watch Dog) unmanned/optionally piloted surface vehicle (USV/OPV) developed by DLTM-lead group of 8-companies under government funding and L3 Calzoni’s Lyra remotely operated vehicle (ROV) in action. 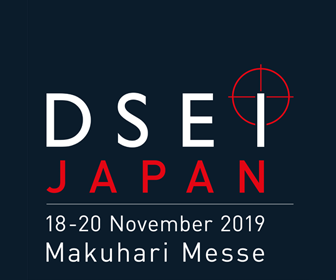 Leonardo and Ingegneria Dei Sistemi (IDS) will also exhibit respectively the AWHero short-range tactical rotary-wing and the IA-17 small fixed-wing UAVs. Foreign delegations will also have the opportunity to visit and experience at sea demonstrations onboard ITS Euro (Maestrale-class frigate), ITS Aviere (Soldati-class fleet-patrol ship), Driade (Minerva-class corvette), and discover how these vessels could find a new life and missions to accomplish in the future, under advice from the Italian Navy and naval shipbuilding industry. The defence of national economic interests at sea and the security of maritime traffics in a geostrategic context characterized by new threats, will be the main theme of the opening forum on the first day (Wednesday 20th) of Seafuture 2018, titled ‘A Comprehensive approach to maritime security’, which will be introduced by the Chief of the Italian Navy, admiral Valter Girardelli. The forum will analyse the modern threats in the maritime domain associated with national economic interests and worldwide traffics security and stability in worldwide traffics. A think-tank grouping the main actors of the Italian maritime cluster will consider traditional and modern point of views (POVs), also studying the increasing connections between maritime and cyber domain. After an initial geo-strategic assessment with the participation of the Italian Ministry of foreign affairs and international cooperation and Ce.S.I. (Center for International Studies), the forum will be enriched by the contribution and analysis by Italian Navy’s Fleet Command, Customs Police and Coast Guard representatives in the Mediterranean basin and beyond. In recent years, the Mediterranean area saw the increasing participation of international players in addition to the NATO’s Allied Maritime Command and its local commands, namely the European Union with EUNAVFOR MED Operations Sophia’s commander and a NATO ‘s naval command representative will deliver a presentation of their present and forecasted engagement in the Mare Nostrum and nearby maritime areas. “Facing global challenges through the technological innovation, towards SHIP 4.0”, will be the main theme of the industry forum on the second day (Thursday, 21st). The forum will provide the stage not only for national giants such as Fincantieri shipbuilding group and Leonardo defence and security group but also for major industrial players such as MBDA and Elettronica, respectively leaders in the missiles and electronic warfare sectors as well as for smaller to medium companies including L3 Calzoni, which will have the opportunity to outline their industrial strategies, products and programs to compete on the international markets, starting from the successful Italian Defence and Navy FREMM procurement program under the European OCCAR’s procurement agency. 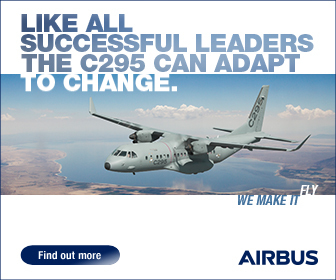 The forum – which will also be attended by the Italian Federation of aerospace, defence and security companies (AIAD) as well as by the Ministry of Economic Development -, will also stress the importance of the dual usability in the technological cooperation between recreational maritime industry and naval shipbuilders through the participation of Nautica Italiana association. Moreover, on the third day (Friday 22nd), Leonardo will present the operational and technical aspects of rotary unmanned aerial system (RUAS) in the naval warfare and maritime operations. The naval focus on the third day (Friday 22th) will be on the European and national excellences in defence procurement and programme management. The Director of OCCAR (Organisation Conjointe de Coopération en matière d’Armement / Organisation for Joint Armament Co-operation) procurement agency and the Director of Italian MoD’s Naval Armaments Directorate (Direzione degli Armamenti Navali – NAVARM) will present their respective organization, mission and vision and reciprocal relationships, with a focus on programmes with the participation or leading position of Italy. Cooperation between France and Italy has led to the successful launch and management of the European Multi-Mission Frigate program (FREMM), the largest naval procurement project in Europe with eighteen ships and today support-in-service. Italy is today leading the Pattugliatore Polivalente d’Altura (PPA – Multipurpose Combatant Patrol Vessel) and the Logistic Support Ship (LSS) shipbuilding programmes. The latter will see the first-of-class vessel launch on the same day of the event at Fincantieri’s Muggiano shipyard, the first type of major ship of the fleet renovation program launched by the Italian Navy in 2015. The LSS programme sees today the participation of France and its naval industries represented by Naval Group giant present at Seafuture 2018, and STX France, as selected LSS shipbuilder. A round table will also be held with major naval industry’s representatives of Leonardo, Fincantieri, Orizzonte Sistemi Navali (OSN) and MBDA Italia in addition to the Directors of OCCAR and NAVARM. In addition to naval platforms, the Italian MoD’s Naval Armaments Directorate (NAVARM) is involved in the development, design, testing, validation and procurement of on-board systems, sensors and weapon systems. During the second day (Thursday 21th) of Seafuture, NAVARM will highlight the implementation of Human Centre Design with the use of virtual reality into the design process, such as developed for the new Italian Navy’s platforms. 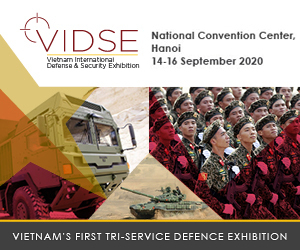 The Directorate and Martec Company will present a number of activities to improve on-board safety such as passive and active protection, damage control and redundant systems, optimization of human machine interface and new hardware for command and control stations. 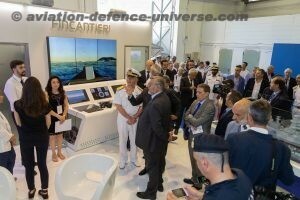 Under the ‘Far Seas’ research project on Lithium Ion Batteries and Battery management system, Italian Navy together with Fincantieri, FAAM and La Sapienza University will present a national propulsion solution for future U212A submarine application. The long-term collaboration between Italian MoD and Leonardo Defence Systems led to the artillery guided ammunitions package for inner-layer defence at longer range with Strales system and to the long-range Vulcano-guided ammunition for precise land deep-strike attacks. The Naval Arsenal of La Spezia, where Seafuture is held, together with Dragonfly company will present the 3D printing technology project for rapid production of spare parts (MARAMASP program). Budget shrinking, and human resources reduction increasingly require a tailored life cycle management approach for warships development, production and in-service support, in order to achieve the best balance between effectiveness and costs through the whole life cycle. On the first day of Seafuture (Wednesday 20th), the Italian Navy Logistic Command will present its knowhow and solutions through the Orizzonte Sistemi Navali’s (OSN) Total Global Support (TGS) FREMM program and latest OCCAR and nationally-managed programmes with OSN, Italian MoD and Systecon Group and Italian Shipowners association representatives. Exploitation of the successful refitting and renovation projects of previously-operated Italian Navy’s vessels for the Bangladesh Coast Guard and Peruvian Navy are case studies for the refitting and renovation forum to be held on the second day (Thursday 21th) of Seafuture with the participation of Fincantieri, small and medium industries, Italian and Peruvian navies and Italian MoD defence industries agency (AID). Foreign naval delegations will have the opportunity to tour the new platforms as the FREMM FasanASW-configured and Luigi Rizzo ASuW-configured frigates, but also experience at sea demonstrations onboard ITS Euro Maestrale-class frigate, ITS Aviere Soldati-class fleet-patrol ship and ITS Driade Minerva-class corvette. Italian MoD’s defence industries agency (AID) will also present its ‘Green ship recycle management’ case studies with Italian Navy’s decommissioned ships. The great challenge of defence research is to foresee the future battlespace, or the theatre of operations in general, to anticipate the warfighters’ future needs. Our country needs to effectively allocate R&D funding to innovate and maintain the technological edge. At the heart of this essential activity is the 5th Division of Italian MoD’s General Secretariat of Defence/National Armaments Directorate which will present a number of programmes, participate in ‘Blue Growth Funding Opportunities: Horizon 2020 & Beyond’ and lead “The Italian technological defence research” workshop with an overview of European Defence Research Programme (EDRP) within European initiatives for defence, being presented during the first day (Wednesday 20th). An introduction will be given to Leonardo-lead OCEAN 2020 EU defence research project, to the national submarine air independent propulsion (AIP) system being experimented by Fincantieri and electric technologies for surface platforms by Trieste University, to the defence against IR-guided weapons by Elettronica’s DIRCM family for airborne and naval applications, Cyber defense and attack on the network and wireless world respectively by Selta and Elettronica, to the use of the space for maritime surveillance and automatic tools for interpretation By Thales Alenia Space and IDS (Ingegneria Dei Sistemi) without forgetting ship simulation and training by Cetena’s R&D centre (Fincantieri group) and the participation of University of Genoa. On the second day (Thursday 21st), the IT MoD will also present the results of the European Strategic technology forecasting survey (Pythia project) with Engineering Ingegneria Informatica and Zanasi & partners, alongside the ‘Haruspex suite’ innovative technology to counter cyber-attacks and the ‘Cyber crisis management’ role play game to stimulate attention on cyber security (on the third day, Friday 22nd). Italian Navy HQs, its Experimentation and Support Centre (CSSN), national industries research centres and universities address the use of unmanned systems in underwater warfare. A shared innovative vision between the Italian Navy, national industry and the Italian research domain in the development, procurement and employment of autonomous underwater and remotely controlled vehicles is at the heart of the two-day long workshop (Thursday 21th and Friday 22nd) with the participation of NATO Science & Technology Organization (STO) Centre for Maritime Research and Experimentation (CMRE), which will contribute with its international knowledge and expertise to highlight the main technological themes discussed and selected in the previous meetings starting from April 2018 (see previous press release) to match the future operational and foreseen needs of Italian Navy in the underwater domain. The autonomous underwater and remotely controlled vehicles exploiting the latest technologies including the artificial intelligence are foreseen to be used in countering underwater unmanned and manned submarines, mines and hybrid threats in addition to conduct intelligence, surveillance and reconnaissance operations. Lead by Italian Navy’s Experimentation and Support Centre (CSSN, Centro di Sperimentazione e Supporto Navale) and Italian Navy’s HQs staff, the workshop will continue its activities during the event at closed doors to put in evidence latest technologies and the gaps to be filled to cope with requirements and concept of operations. 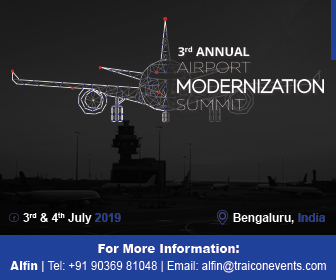 The workshop activities will continue in the incoming months, enriching the participating industries’ potential capabilities in intercepting national and European R&D funding offering. ATENA (Associazione di Tecnica Navale) and Pisa University will present the activities in the electromagnetic spectrum control and management, including electronic warfare and signature control. The traditional concept of operations warfare has evolved and today coincides with the dominance of the spectrum. After an introductory paper by Italian Navy’s General Staff, major industrial players including Leonardo, Elettronica, MBDA, IDS (Ingegneria Dei Sistemi), Cetena (Fincantieri group), Pisa University, CNIT-RASS laboratory, Keysight, and the Italian Navy’s R&D centres of excellence including the Experimentation and Support Centre (Centro di Sperimentazione e Supporto Navale) and the Joint Forces’ Studies and Military Applications Centre (CISAM, Centro Interforze Studi ed Applicazioni Militari) will provide an overview of latest development in this sector in the maritime domain, highlighting the R&D and applied technologies to the latest naval platforms such as the integrated radar and EW suite of the Pattugliatore Polivalente d’Altura, as well as developments in sensors, electronic warfare and cyberwarfare. The International Navy Safety Association (INSA), a team of international navies and classification societies, has been developed on NATO request and has now published a safety code for warships, known as the Naval Ship Code and published as ANEP 77. Italy’s RINA classification society and an Italian Navy representative will discuss the code’s development, its use on a number of recent warship projects, analyzing both technical and practical applications, and the future plans for the code.